In the United States, health is a privilege: it is health care for profit. If you can afford it, you can have it. But is not a strong nation a healthy nation? If health was a right of all citizens, would not the nation be better off? Of course, the first question for anybody is whether or not the United States can pay for such a thing. After all, the claim by the Right is that Obamacare will bankrupt the nation. The answer has been hotly debated and continues to be hotly debated but one set of facts is in, have been confirmed, and cannot be denied. The United States pays more money for its current health system than any other country on the planet. Yes, on the planet. How is it that the supposed number one country pays more than anybody else? If the Right keeps promoting the concept of free markets, why hasn't health care for profit led to inexpensive care? Instead, Americans pay more than Canadians and more than the French (oh that's gotta hurt). 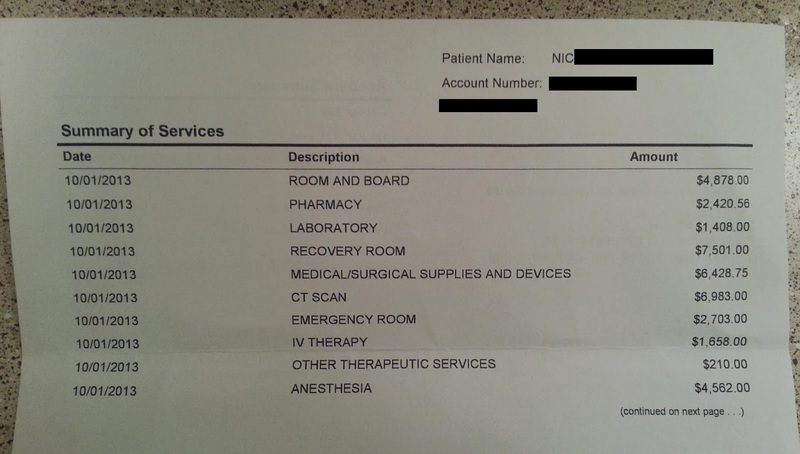 Recently, a Reddit user, known only as "zcypher", has become a bit of a celebrity since posting pictures of the hospital bill for his October appendectomy. Total cost: $55,000. Fortunately, his insurance covered a good portion of the bill but that still left him with $11,119.53 to pay out of his own pocket. As a Canadian, I am stunned by this. If I had an appendectomy, I would never see a bill. Canada has universal health care. It is a right of all citizens; it is not a privilege for those who can afford it. As well as covering the story, they present some of the comments on Reddit from other countries. "We're number one! We're number one!" Wait a sec. Being number one in the world isn't always a good thing. "Colonoscopies Explain Why U.S. Leads the World in Health Expenditures"
The magazine gives 5 points to explain the extraordinary amount of money charged for what should have been a routine procedure. 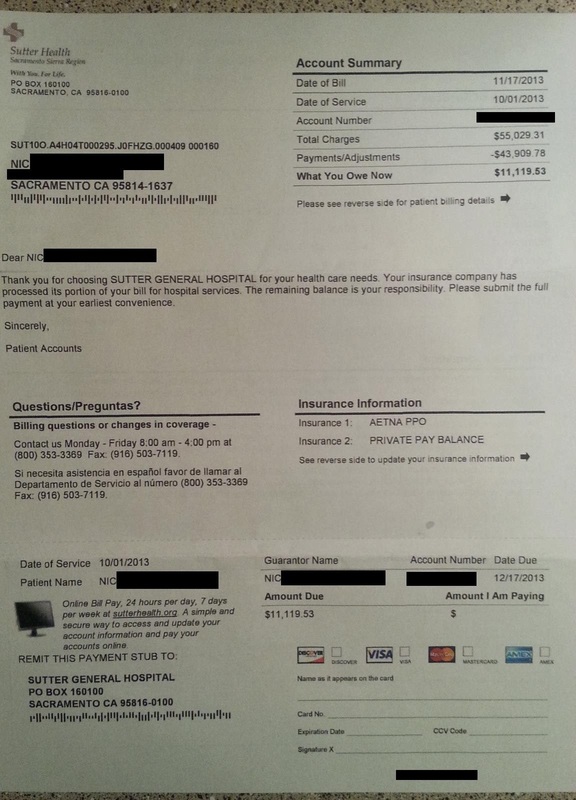 Sutter Health, which owns the hospital where zcypher had his appendectomy, has been sued for overcharging. Hospitals routinely charge vastly different amounts for the same procedure. Certain hospitals may be responsible for a large percentage of overcharging. You can do a little research to see if you are being ripped off. 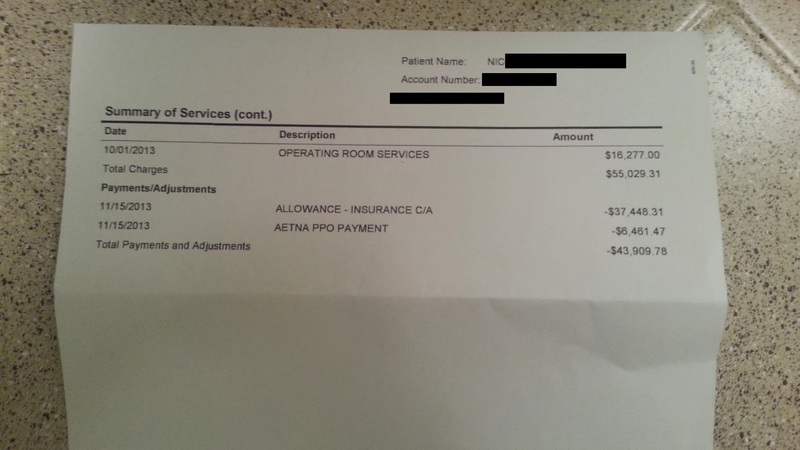 People who don't argue about strange charges on their hospital bills are probably overpaying. After Tracy Rud of Atlanta was rushed to Northside Hospital-Cherokee for urgent gall bladder surgery in April, she received a seven-page bill that totaled nearly $40,000. "I wanted to cry," she told ABC News. "I just thought, 'This is way too high.' … I was just flabbergasted at what health care costs in the hospital." I have been following the debate about Obamacare for quite some time. I remain somewhat flabbergasted by the intransigence of the Right about reforming the American health care system. Even if I go along with the idea that Obamacare is flawed, I have more than enough warning bells signalling an urgent need to investigate the current situation. There are more than enough horror stories of people going bankrupt due to a health issue. On January 1, 2014, I had the following exchange on Twitter. @wqbelle his appendix ruptured which is life-threatening and not a routine appendectomy. He should be thankful surgeon saved his life. @ernestine1006 I'm Canadian. I believe such a procedure would be free. Obamacare seems like a good first step. @ernestine1006 refers to the following story. It continues to be a bad week for the Fraser Health Authority. CEO Dr. Nigel Murray insists emergency room staff followed proper protocols when they sent a 90-year-old woman home from Delta’s hospital last week in a cab at 2 a.m. But a Walnut Grove man watched his wife suffer for several hours last Friday at Surrey Memorial with a burst appendix, and says he still hasn’t been told why. It turns out the emergency room for hospital in question was understaffed. But here is the curious point about this Twitter exchange. @ernestine1006 says she is Conservative and I assume this means she is against Obamacare. Based on one example, the above story about Surrey B.C., she condemns the Canadian health care system. I tweeted a link to my posting prefaced with "Would you vote to let 18,000 people die?" A commentator wrote back and said he didn't believe it; it was all just a bunch of liberal B.S. Condemn Canada's universal health care system? 18,000 dying annually is liberal BS? Who needs facts when you have faith? What is it going to take to get you people to wake up and smell the coffee? Will the ideology of the Right seize the day and ensure the United States remains the only advanced industrialised nation without universal health care? How strange. The vocal minority demands the right to bear arms but seems to care less about the right to health care. They demand the right to kill ya but not the right to cure ya. Standing at a distance, I find this to be an odd set of personal values. Every man for himself. It's the zombie apocalypse. John discusses the complicated reasons why the United States spends so much more on health care than any other country in the world, and along the way reveals some surprising information, including that Americans spend more of their tax dollars on public health care than people in Canada, the UK, or Australia. Who's at fault? Insurance companies? Drug companies? Malpractice lawyers? Hospitals? Or is it more complicated than a simple blame game? Comparison of the health care systems in Canada and the United States is often made by government, public health and public policy analysts. The two countries had similar health care systems before Canada changed its system in the 1960s and 1970s. The United States spends much more money on health care than Canada, on both a per-capita basis and as a percentage of GDP. In 2006, per-capita spending for health care in Canada was US$3,678; in the U.S., US$6,714. The U.S. spent 15.3% of GDP on health care in that year; Canada spent 10.0%. In 2006, 70% of health care spending in Canada was financed by government, versus 46% in the United States. This makes my head explode...except, of course, I couldn't afford the ER charges. I wanna be Canadian. Or French. Maybe Cuban?